How to get rid of moths in your rug? 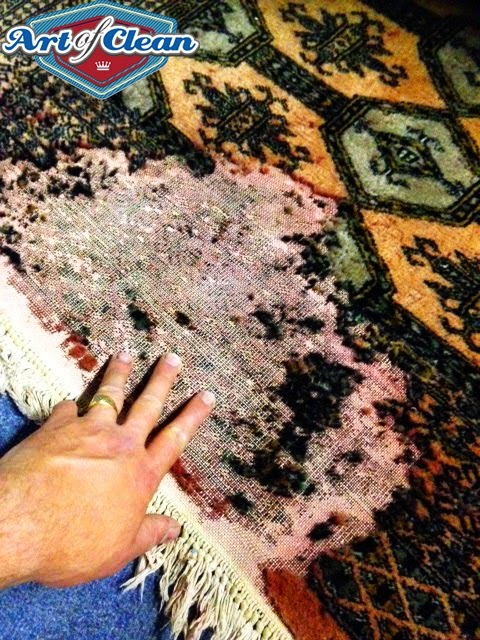 Moth damage to rugs was as a high this year due to the warmer winter we had last year. Have patches of your rug started to disappear? This is moth damage. Moths have laid their eggs in the carpet, deep down where it is dark and dirty. The larva then hatch and start eating the dirt and fibers in the rug. The larva will continue to eat away until they turn to moths and the whole process repeats itself. Prevention – Vacuum your rug regularly, and give all areas of your home, including the darker less accessible areas such as under and behind furniture , a serious vacuuming as moths like to bread in dark undisturbed places. A quick once over will remove some of the food and dirt that attract the moths, however a thorough cleaning is needed to try to catch the eggs. Professional help – if you have noticed the larva in your rug (they are very small, white caterpillar like creatures) or bald patches appearing on your rug you will need expert help immediately as vacuuming will not remove the whole infestation and it will persist. To treat your we us a safe method of carefully freezing the rugs to -15 degrees. The cold temperature successfully kills all the larva and eggs. We would then thoroughly clean the rug thoroughly to remove any dirt, and apply a moth repellent. If you have found moths in your house you must inspect your whole home. They are the same moths that you'd call carpet moths or clothes moths, and will live in any fiber including clothes, upholstery and carpets. Any eggs or larva left elsewhere in your home may result in the return of the moths to the rug. Art of Clean are proud members of the Mater Rug Cleaners Association. If you would like any further information on our rug cleaning service please contact our friendly team on 01223 863632, or see our website for more details www.artofclean.co.uk. What to do with your old wooden floor - recycle it! How to get the perfect white wash effect on your wooden floor?